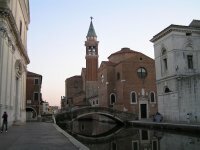 Very alike Venice: canals and bridges, churches, mirroring in the water. But it's no crowd of Venice here. Chioggia is quiet.